Lens Description: Versatile 5X zoom lens, Aspherical lens elements for minimized distortion, IF (Internal Focusing) technology for fast AF operation. I have one of these but when attached to my D40x the auto focus doesn’t seem to wanna work. Your AF will not work with this lens. or DX bodies with the internal focus motor (D50, D70/70s, D80, D90, D300/300s, D7000+). Anything D5000+ , D3000+ including D40/40x, D60 will NOT Autofocus. Still a good all around lens to keep if you don’t mind manually focusing. Any Nikon / Nikkor lens with a “DX” label on it will AF on your D40x. Vic, I have had this lens with my D100 for 10+ years, and I to honest I was never really impressed. I’ll be getting a D700 soon from a friend, do you think I should hang on to this lens? 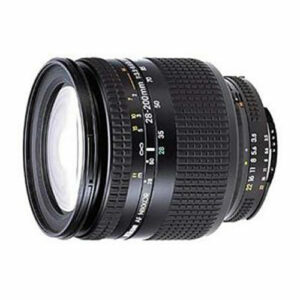 I recently purchased one of these as a general use all purpose lens for my D700. I’ve read both good and bad reviews about this lens. I hope I didn’t make a mistake. If you get a good copy, you will love it. First time I had used this lens was back in 2002 with Film and I perhaps got a bad copy one which had no sharpness and low contrast so I sold it after one month. Recently, I gave myself a try buying this lens again after seeing lots of people saying how wonderful it was. And this time I got lucky getting a good copy using with D700 D610 and D750, Umm!!! Sharpness is not bad this time. Overall I have satisfied. After taking several test shots with this lens I’ve noticed that this lens has a tendency of bending straight lines. Especially Horizontal ones. Thankfully this can be corrected in Adobe Lightroom. Other than that, I’m still happy with the images so far.